Soaring stock market valuations on both sides of the Atlantic are stoking fears of a looming correction as valuations hit levels not seen since the dotcom bubble and the eve of the Wall Street crash. Stocks are trading at levels only previously reached in the run-up to Black Tuesday and the tech collapse of 2000, fuelling concerns among economists that markets are destined for a devastating reversal that would throw world economic growth off track. “In both cases, sharp market ­declines followed these high readings,” warned Graham Hacche at the National Institute for Economic and Social ­Research (NIESR). 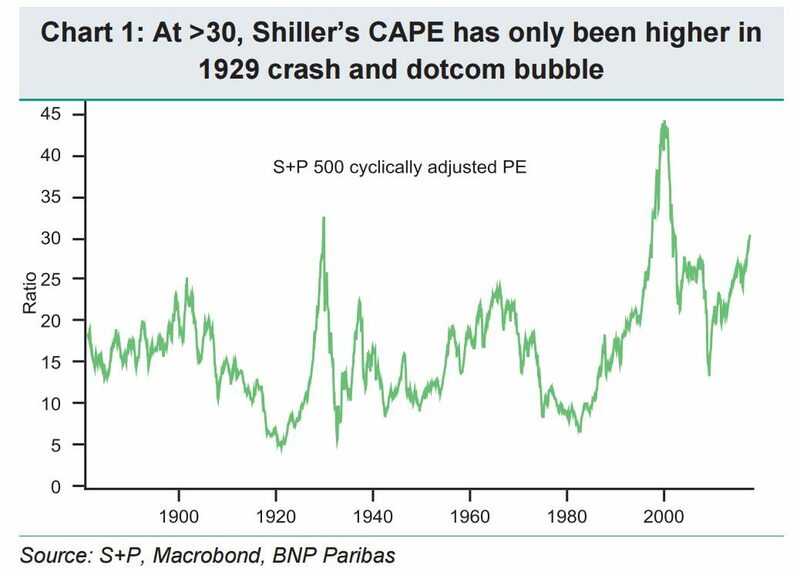 Pointing to the cyclically adjusted price-earnings ratio (the Shiller CAPE ratio), rising to above 30, Mr Hacche said that this indicated “markets may have become increasingly vulnerable to shocks”, which “could have significant negative repercussions on private consumption and investment”. The London stock market closed at a fresh record high of 7560.35 on Friday a day after the Bank of England raised interest rates for the first time in a decade. Meanwhile, US equities also ended the week at record highs. Mr Hacche said that markets were vulnerable to a wide range of shocks, which could emerge from anywhere across the world. “Markets are vulnerable not only to autonomous changes in sentiment but also to economic policies including policy failures and mis-steps,” he said. Excessively high interest rates could trigger a crash, while unreasonably low rates could also create a bubble, followed by a bust, he said. Slashing financial regulation, a sharp rise in protectionism – which could dent growth suddenly – rapid tightening of monetary policy in the eurozone, and a crunch in China’s debt markets could also set off shock waves across the world and into US stocks. Analysts at BNP Paribas are on alert for geopolitical risks and a surge in ­inflation – and thus interest rates. ­Although there is no guarantee stocks will fall back sharply, they are watching for any “catalysts for correction”. “With the US consumer having been reliant on wealth gains to drive down the savings ratio, an asset price correction could provoke a recession,” said chief market economist Paul Mortimer-Lee. The risk will rise as the global economy runs closer to full capacity, inflation rises and central banks adjust their balance sheets, he believes. HSBC’s Janet Henry also warns that stock valuations in the US and in ­Europe “are not obviously consistent with the underlying performance of the economy”. » Three decades since Black Monday – are markets on the verge of another tumble?